No safari in Kenya would be complete without visiting Maasai Mara National Reserve, Kenya’s most famous game area. Known for the annual wildebeest migration the area boasts a large, permanent population of animals so game viewing is good year round. During five game drives, keep your eyes open for rhino, giraffe, topi, hyena, lion, and much more. Beyond the Maasai Mara, visit Mount Kenya National Park, where your treetop lodge gives you unobstructed views of the waterhole that attracts elephant and buffalo. You’ll also enjoy a guided forest walk with a naturalist followed by a bush breakfast here. In Lake Nakuru National Park world-famous for its flamingo, search for giraffe, waterbuck, zebra, Cape buffalo, impala, and more. Your best chance to get close to giant elephants is in the swamps of Amboseli National Park. Consult your physician for the latest health requirements for travel to Kenya. Due to limited capacity on safari vehicles flights, your suitcase must be soft-sided. Safari mini-bus, between destinations and for game drives, with a pop-up roof for easy game viewing and photography. We limit each safari mini-bus to a maximum of 6 people, ensuring you’ll always have a window seat. Welcome to Africa! Arrive this evening, check in to your hotel, and prepare for your safari adventure! Start your sightseeing at the SHELDRICK ELEPHANT ORPHANAGE, founded and managed by Daphne Sheldrick. During your visit, learn about elephant conservation and meet elephant calves orphaned by poachers before they are re-introduced to the wild. Next, visit the GIRAFFE CENTER, a non-profit organization focused on saving the Rothschild’s giraffe. Here, you will learn a bit more about this sub-species and have the opportunity to feed them. Then, depart Nairobi for MOUNT KENYA NATIONAL PARK, where your treetop lodge is raised on stilts with unobstructed views over a floodlit waterhole. Spend the afternoon and evening observing the animals from the viewing deck or the balcony in your room. This morning, embark on a GUIDED FOREST WALK with a naturalist to learn more about the plant and animal life in the area. Afterward, a BUSH BREAKFAST awaits. Later, journey through the beautiful Kenyan highlands. Known as one of the most fertile agricultural areas in all of Africa, you will find farmers growing crops such as corn, wheat, coffee, and tea. Arrive in LAKE NAKURU NATIONAL PARK and settle in for the evening. Today, enjoy MORNING & AFTERNOON GAME DRIVES. The park is home to a variety of animals including giraffe, flamingo, impala, Cape buffalo, and striped hyena. This is also your best chance to see white rhino, which are commonly spotted here. After breakfast, make the short drive to LAKE NAIVASHA NATIONAL PARK. Make a stop at LIFE BEADS, an organization providing training and job opportunities to local women, disabled people, and street children. Here, trainees learn how to make a variety of handicrafts including beading and basket making. After lunch, take a GUIDED WALK around Crescent Island for a chance at an up-close view of giraffe, zebra, and more. This morning, depart for MAASAI MARA NATIONAL RESERVE, Kenya’s most famous game area. After lunch at your lodge, set out on an AFTERNOON GAME DRIVE. Today, enjoy MORNING & AFTERNOON GAME DRIVES in the “Mara,” as it is called by locals. Part of the Serengeti ecosystem, the reserve boasts a strong permanent population of game. When the Great Migration of wildebeest and zebra arrives, generally from August to early November, the population enlarges by almost 2 million. This provides a great food source for predators such as lion, cheetah, leopard, and hyena. 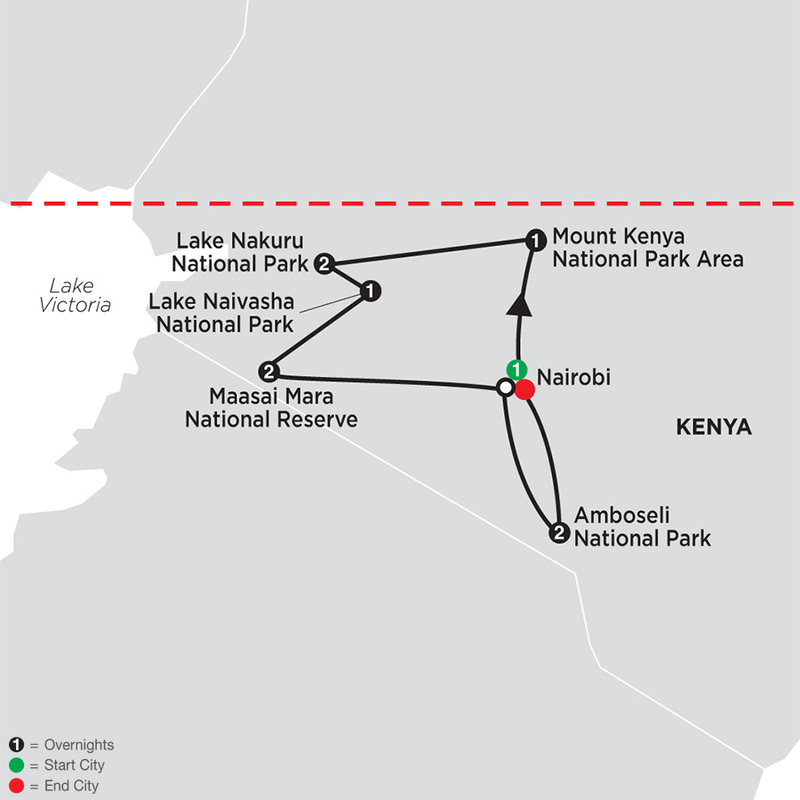 Today, drive to AMBOSELI NATIONAL PARK, with a stop in Nairobi en route. Upon arrival, settle in at your lodge for the evening. MORNING & AFTERNOON GAME DRIVES are included today. Amboseli is best known for spectacular views of Mount Kilimanjaro but also affords you a great opportunity to get close to the mighty elephant. You might also spot Cape buffalo, zebra, wild dog, and more. Today, drive back to Nairobi, where your tour ends. We have reserved a day room at the Eka Hotel Nairobi for you to use prior to your homebound flight. Book homebound flights after 5 pm.